Resource for bloggers - oh, and I win a prize. The book will be out at the end of May and then I’ll write Kilty #5! Here’s the adorable cover – let me know what you think! Win up to 20+ Fantasy eBooks + Bonus Paperbacks! This cozy mystery anthology brings you FOUR fast paced murder mysteries with twists and turns and plenty of suspects and red herrings. Every book in this set has been a bestseller and has entertained thousands of readers. New Release from Dianne Harman! Family secrets. A murdered mother. An estranged aunt. A diary. A vandalized high school. Holly knows nothing about her biological family living in Missouri. When her aunt invites her to stay with them for two weeks after her mother’s murder, she has mixed feeling but decides to accept the invitation. Once she’s there, she’s determined to find out why her mother chose to live alone and at a distance from her family. What happened, and why won’t her aunt talk about it? Does the diary she finds hold the key? And who’s been vandalizing the high school? Her cousin’s friend has been accused, but is she guilty? Holly has to use her skills solving mysteries both at the high school and in her family. 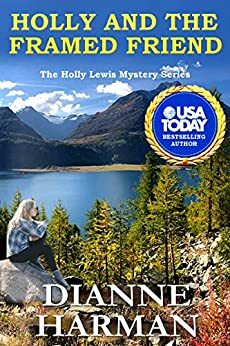 If you loved Nancy Drew, you don’t want to miss the debut novel in the Holly Lewis series by two-time USA Today Bestselling Author, Dianne Harman. If I judge this book by its cover, I’d say this must be a humorous one. Looks great – I think some of the puppies are incognito!! Ooh, I love the cuties on this cover! What a delightful sneak, you rascal! Thanks for sharing this secret!